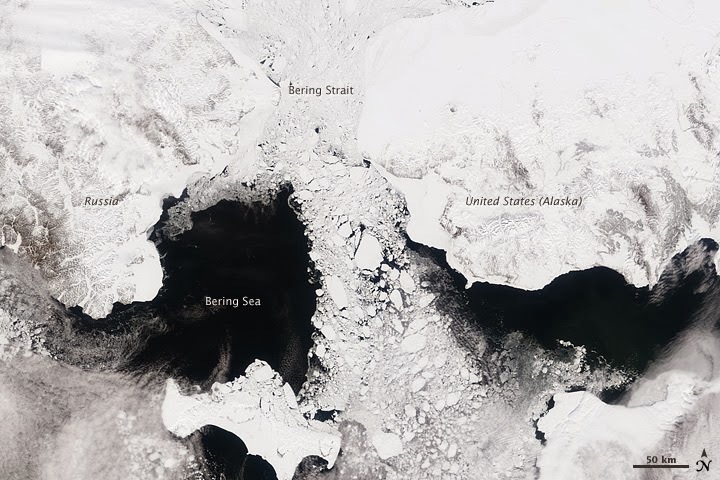 A passel of scientists/alarmists trying to prove global warming got trapped in Arctic ice. That said, living in the Sierra Nevada Mountains at the 4,000-foot level, I've only received one snowfall in mid-December of 2013, and it was somewhat pedestrian. Not that my back or my shovel are complaining, mind you. This video was made just before my December snowfall as the #6 California Zephyr left Colfax and gained track speed of 30 mph on its way towards the Long Ravine bridge and then Cape Horn. 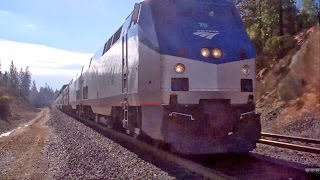 One point I love: listen to the horn as the train passes: a clear example of the Doppler Effect. Two engines, nine cars, some very bruised clouds and a vocal crow in the background. Colfax can be a tricky place for trains and engineers, as it sits in a bit of a depression. Approaching Colfax, an engineer must not let the train run away and exceed the speed limit as you are traveling downhill by a few degrees. Leaving Colfax, there is a bit of a climb and, if stopping, one must ensure sufficient braking energy so the train does not begin to back up. This is a challenge for engineers who must spot bad order cars or move to a siding in Colfax. As you can see, this Zephyr is led by the standard GE Genesis P42DC locomotive with 4,200 hp. If you wish to examine the interior of an Amtrak P42DC locomotive, check my post here for great detail. 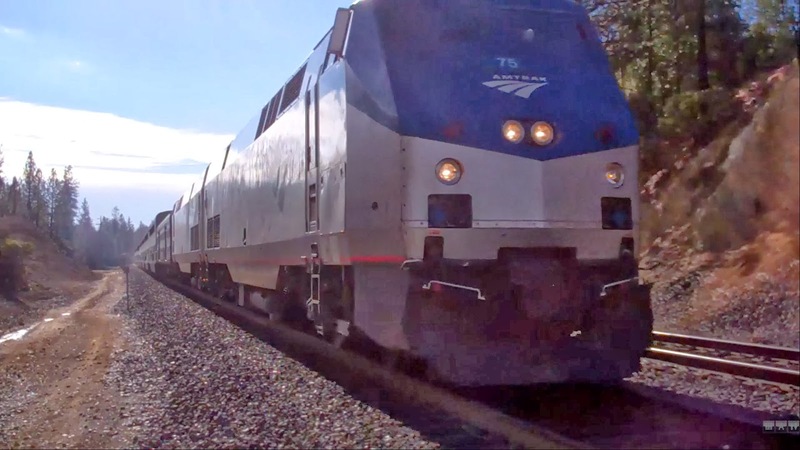 An interesting point: at a time when most diesel-electric locomotives have transitioned over to AC driven power, Amtrak's fleet consists primarily of DC locomotives. This, frankly, speaks volumes about the durability and efficacy of GE's original Genesis fleet and their reliability.